Starting today, Brew Haven will be starting a new post topic labeled “Brew Haven DIY” which is scheduled to post once a month on the 15th of each month. You will find information for creating and modifying equipment and processes. If you’d like to contribute head over to This Forum Post and let us know what you’d like to write about. 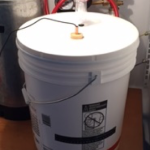 For the very first post, Michael Davies documented the creation of his DIY Fermentation Bucket with Thermowell. For those who ferment in a plastic bucket, the advantages of using and maintaining one plus the low initial cost make these an attractive alternative to other containers, namely glass or stainless steel. 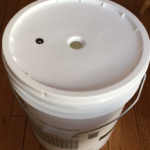 The pros and cons of a bucket is not the purpose of this article, rather the actual use of one is examined in regards to ease of access to the fermenting beer and how a small modification to it can make life easier and decrease chances of oxidation or intrusion of unwanted microbes. 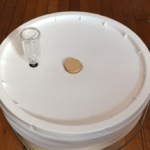 After using my 8-gallon bucket, I saw right away that the lid on it is very tight, which is good, but taking it off to get a gravity sample or to dry-hop was a pain. It also exposed the beer to the environment and let the CO2 “blanket” escape. The remedy for this predicament was to drill a hole in the center of the lid big enough for a rubber stopper to fit. This way, anytime I wanted to take a sample out with my baster, I just pulled the plug out and pushed it back in when finished. If I also wanted to dry-hop or add cacao nibs or something, the hole is also the conduit. I happened already have #7 stoppers, both solid and drilled, so I drilled a hole in the lid with a 1¼” spade drill bit and it fit perfectly. As a bonus, if you have a temperature-controlled fermentation chamber and use an Inkbird or some other type of controller, an easy DIY thermowell can be quickly made which fits nicely through a drilled stopper in which the probe can go into. Real time temperatures can be measured throughout fermentation as opposed to taping the probe to the side of the bucket. The remainder of the article will describe how the thermowell is made and inserted into the bucket. 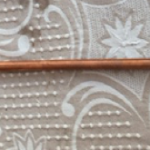 Materials used: one 12” length of straight ¼” copper tubing (Lowes, Home Depot- $5.00), one ¼” cap to be soldered onto one end ($1.00), soldering supplies (hand-held propane tank and tip, lead-free flux, silver solder), rotary sander (Dremel) to smooth out soldered end. One end of the tubing is prepped and the cap is soldered onto it. If possible, sand the excess solder smooth so there are no rough or sharp edges. The ¼” tubing fits snugly into a drilled-out stopper and can be height-adjusted. There is no fear of contamination because the capped end prevents beer from entering the thermowell. 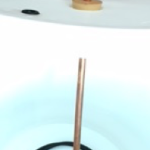 The stopper is inserted into 1¼”hole and the temp controlled probe is put into the copper tubing as far as it will go. The temp of the fermenting beer is conducted to the probe and as it is in the center of the liquid mass, precise control of the desired temperature is maintained. 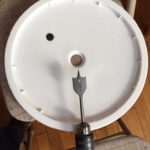 When fermentation slows down, the thermowell stopper is pulled out, a quick sample is obtained for gravity reading, and the stopper replaced all without taking the lid off, thus greatly reducing exposure to air. Dry-hop additions are done the same way. After cold crashing, racking to a keg or bottling bucket can be performed with a racking cane or auto-siphon via our beloved hole. From the time wort is put into the bucket fermenter and pitched, there is really no reason to take the lid off until it is empty. This simple modification of drilling an access hole becomes an instant benefit to the brewer which provides multiple advantages and ultimately simplifies the task at hand.